Three blind mice : how the TV networks lost their way · One Book. One Author. One Hour. Notes on front fly: Dinner party at Grossman's 1. Do you think network news is a public trust; 2. Politics of Welch, Tisch, Murphy; 3. None watched prime time 36/55/17. 17-36-55 Jack Welch, Wyman/Tisch, Tom Murphy. Notes and underlinings: Handful of people refused interviews. Welch saw no difference in consumer business and News. Larry Grossman --liberal government; believed possible to end poverty, inner city decay, education, pollution, crime, racism, discrimination--educate public to do good. Murphy--despite rarely watching entertainment programming, knew how to read bottom line. Tisch brothers acquired Lowes stock for $14/share; by 1986 worth $4,000/share. CBS board and Tisch; directors approved news division budget, not components. Bothered by multi-million contracts for Hewitt, Wallace and Rather. By 1988 ABC best managed, most pleasant place to work--8 stations. Larry Grossman, decent man--NBC news no longer golden, now spoiled child reduced to stepchild. News budget to dip from $257.8 million in 1987 to $245.9 in 1988, $237 by 1990. of 5,900 NBC news stories taped, half were planned with long lead time; while almost all breaking stories got aired, only 2/3 of the planned stories aired--75% of News personnel's time--rely on stations to cover domestic news. Michael Gartner--1st Amendment absolutist--government should never interfere with the press. Gartner/Wright frustrated with elitist journalistic culture. Grossman learns of plot to replace him--doesn't believe it. Welch/Wright trying to impose GE's culture on NBC; Murphy/Dan Burke out to make ABC employees feel secure. David Burke--comes down to last day in hospital, Tisch may be pleased with stock market price of company, not Burke's values. CBS news made $50 million after expenses of $330 million in 1989. 1988 3 network newscasts reached only 60% of viewers--loss of 2.5 million viewers in 3 years. By Nov. revenues for NBC news fell below budget. $70 million vs. budgeted $54 million. To cut 1989 budget to $245 million, Gartner ordered $55 million in savings. Whereas Grossman's niceness seemed weak; Gartner came off as combative--managed like dictator, appeared arrogant. Gartner blunt, not adept at small talk, hadn't advanced GE cultural revolution as hoped, in less than a year NBC ready to replace Gartner. Don Ohlmeyer offered job, but declined. Gartner remains. On news, Gratner notes that no one looks at content, only salaries or nonessential things. Tom Murphy at retirement dinner--harkens Edward R. Murrow as a hero, news division dear to his heart--proud--more Americans get their news from ABC News. ABC better place to work. By 1991 all three networks garnered only 54% of TV viewers, loss of 1/3 in a decade. Huge revenue losses for all three networks. Cable profits dwarfing network TV profits. Networks provide shared experience, sense of community. Networks cannot recapture monopoly. Must produce, own sell more of their own product. 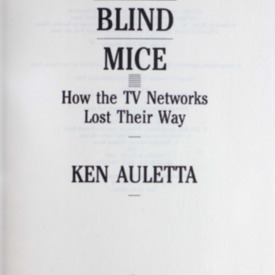 Auletta, Ken, “Three blind mice : how the TV networks lost their way,” One Book. One Author. One Hour., accessed April 24, 2019, http://booknotes.gmu.edu/items/show/215. Program air date: October 6, 1991.